Having developed our own In-House Professional Duplication Facility we can now offer these services to the public. From the smallest quantities to any large order, we can meet any demand. 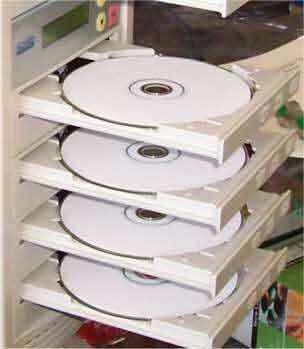 We have the latest state of the art Duplication Facility incorporating full colour printing services on either white or silver discs. We use only the highest quality discs (Ritek) to ensure a constant level of reliability and quality. We can also offer full editing services for DV video. As we specialise in motorsport and in particular on-board camera work we can edit and produce full professional standard DVD's including working menus and images tailored to your own personal needs.